Very scholarly summary, Trade Wind I have a few questions. Why does the ocean temp along the West Coast seem to stay within 10 degrees all year? It seems that since the source of the water comes out of the Gulf of Alaska it would be super cold during winter. But along the California coast it pretty much stays in the 50's\ 60's all year. I understand how the opposite occurs along the East Coast but why do Atlantic ocean drop down 40's\ 50's during winter with the warm Gulf Stream offshore? There's another interesting phenomena along the West Coast when the winds dramatically lower offshore the water temps can even top 80F in SoCal. Does that stop the Japanese current or just divert it elsewhere? This can happen during El Nino's also. Let me just give you my 2c on the water temp issue…as I have been to both beaches on the East Coast and West Coast (I’m an older beach nomad – lol)… and I did a lot of research about this subject many years ago. It always baffled my how LA County beaches could be almost 400 miles south of say beaches in Maryland, New Jersey …yet have cooler ocean waters in summer. 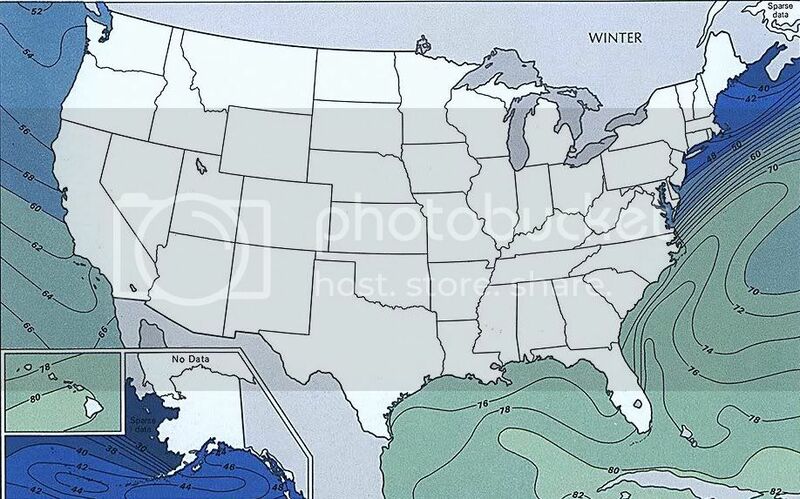 Also, while I could understand that much of Florida would have warmer ocean waters than southern California (it is much further south)… how on earth could places like Georgia/South Carolina/the Gulf Coast… have ocean waters so much warmer than places like San Diego or Newport Beach? In California…the prevailing wind blows parallel to the coastline, causing a deflection of surface water (by the coriolis force) away from the coastline. In response to the movement of surface water away from the California coast, very cold water from deeper levels rises to replace the deflected water, a process called upwelling. Further, the underlying currents (from where the upwelled water comes from)…come out of the Pacific off northwest Canada (sub-Arctic). For the West Coast it’s a double whammy. Even though it’s only mid April…you can see how much warmer the Gulf/ East Coast ocean waters are compared to the West Coast: The Pacific off LA is around 59 F (14 C)…while near the same latitude on the East Coast (South Carolina) the Atlantic in 71 F (21 C) and the Gulf Coast is also near 70 F. Look at South Florida…the Atlantic is already 77 F (25 C)! Keep in mind these numbers are about 3 to 5 F BELOW average due to the extreme cold in the Gulf States this winter. By late May...ocean temps will be 80 F or higher from Texas to South Carolina...and the mid 80's off Florida (By late June 77 F ocean temps reach southern New Jersey !). It is a bit shocking to see 25 C waters around the south Florida/Florida Keys now…and see that on the West Coast one must go all the way to Cabo San Lucas, Mexico to find equivalent ocean temps. From what I understand…the oceanic circulation in the North Pacific is a circle. The currents that come down along the California coast are fairly cold (considering their latitude) …they pass south of Baja …then turn west toward the Hawaiian islands…then northwest… then north again toward northeast Canada (a loop). So the water arriving off the NW Canadian coast has come from the central Pacific…and is not cold at all (this is why the immediate Aleutians Island of Alaska are relatively mild (for their latitude). The Pacific waters are actually chilled on their way south toward the Western seaboard of the USA. This is why there is not such a great difference between winter/summer sea surface temps…at least in Northern California. In southern California (below Santa Barbara or so)…latitude and air mass influence (hot weather /the subtropics) help raise water temps at least in the summer months. I don’t know if the open Pacific off California ever gets much beyond 75 F in summer. It’s common for shallow protected water to be artificially higher than normal I’m sure. I have seen water temperatures as high as 96 F in shallow waters in the Bahamas in summer… of course the ocean is not that warm. Perhaps when the wind dies or slackens alot…the waters from off Baja can move further north. In mid summer the waters off Baja are quite warm, often approaching 80 F I think. I would think this is why places down near San Diego can get warmer sea temps than places along the Central –CA coast. As far as winter sea temps in the Gulf/Atlantic…around the Maryland/New Jersey coast in deep winter the Atlantic might fall to the upper 40’s for a month or so. This occurs because of the occasional cold air masses that pass off the upper East Coast in the winter months…the strong offshore flow of northwest winds (pushing the Gulf Stream even further off shore)…and the weakening of the subtropical high. In the Gulf/South Atlantic…from what I have seen, the lowest the ocean ever gets in late winter is the low/mid 50’s for a few weeks in late winter from what I understand I have been to Panama City, Florida on the Gulf Coast in January, and the water temp was 60 F. Of course South Florida and the Keys are always fed by the Gulf Stream, so even in the dead of winter it’s rare to have sea surface temps of less than 75 F or so. I will try to find an ocean circulation map...I think it would be interesting. I think strong up-welling & the depth of the ocean off California contribute to the cold water but make the fishing industry very happy. Maybe a reason why the Pacific doesn't cool down much during winter is that the air masses moving ashore on the West Coast are strongly influenced by the ocean & arctic air doesn't really reach California keeping the ocean more mild then even the Southeast US coastline. I ‘m sure that air mass control plays some role in keeping the coastal waters off California from getting that cold in winter. However, remember that unlike land…water takes a long time to heat up…and a long time to cool off. This is why most oceanic controlled climates have much less a seasonal change in temperatures: Seattle has far less difference between winter and summer temps than say Montreal, Canada at the same latitude. 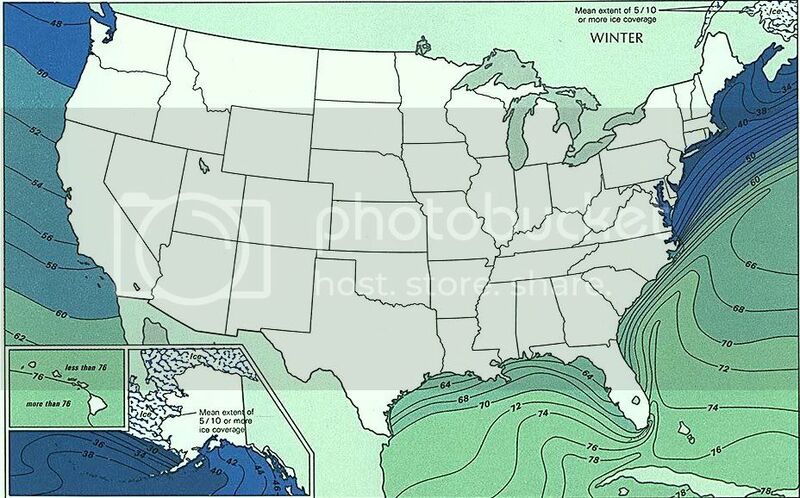 Generally, far south Florida and Hawaii have the warmest sea –surface temps in winter...followed by the Gulf and South Atlantic States…the California Coast south to north … the Middle Atlantic Coast from Virginia to Connecticut south to north … New England...then the extreme Aleutians . Keep in mind that early winter (December) sea surface temps are still semi-high in most of the USA (sea cools slowly)...so the averages for the 3 winter months might seem higher in any local area. At the same time...for a few weeks in late February (sea warms slowly)...sea surface temps might be as much as 3 to 5 F colder than the mean winter temps. Last edited by Trade Wind; 04-18-2010 at 08:50 AM..
it's funny, at first i thought the air temps contributed to the cooler ocean temps, but really it seems like the other way around in that maybe cali isn't all that warm along the coast simply because the ocean temps are cooler due to what tradewind said. it seems like the ocean temps act more as a moderating effect on land temps than i originally thought which is maybe why it doesn't get as warm during the summer along the west coast as it does in the east. Oh, yeah - the ocean IS the moderator to be sure (NOT the land) - for the very reason mentioned (that water takes longer to warm up or cool off than the earths' surface does). Here in Seattle we have plenty of proof of that. Washington state (and Oregon for that matter) is effectively divided into 2 distinct climates separated from each other by the north/south spine of the Cascade Mountains. The western side (bordering the Pacific) is mild and wet. In spite being VERY FAR north our winters here are extremely mild - with overnight lows in January generally in the mid 30's or so and highs in the mid 40's. At NO time of the year does the AVERAGE overnight low EVER drop below freezing. This is why Seattle has such a reputation for rainy weather - it's all the rain (not snow) we get during the winter months. The foothills and upper reaches of the Cascades of course get LOTS of snow (world record for snowfall (1,140 inches (95 feet)) but down in the lowlands where Seattle is it's pretty much all rain (with just an occassional snowfall (this past winter we had NONE)). Compare that with places like Chicago or Minneapolis - both of which are further south than Seattle but MUCH MUCH colder in the winter. Take a look at the comparison chart. You can see that we're a good 20 degrees warmer in the winter than Minneapolis - even though we are further north. In fact, in regards to (for example) the USDA climate/growing zones Seattle is REMARKABLY mild in the winter. These zones break the country up into different areas based on what the typical "most extreme" cold can be expected to be during any given winter. Note that these are not the AVERAGE cold temperatures - but (as I said) the average "most extreme" - in other words the very coldest night of the year. If you look at the linked map, you'll see that Seattle is in zone 8 (a or b - depending on exactly WHERE in the Seattle area). This puts it in the very same climate/growing zone as much of the area around the northern part of the Gulf Coast (including the panhandle of Florida). In other words, Seattle's typical coldest winter night is comparable with the typical coldest winter night in places like Gainesville, Florida. Remember - this is not the AVERAGE overnight low (which is still pretty mild) but the most EXTREMELY cold low that can be expected on any given year. No matter how you slice it however, Seattle has VERY MILD winters (again ESPECIALLY when you consider that we're about as far north as you can be in the "Lower 48"). On the eastern side of the Cascade Mountains however it IS brutally cold in the winter - more like Chicago - even though it's only a 2 hour drive away. The difference of course is the moderating influence of the Pacific Ocean. It keeps everything west of the Cascades (which serves as barrier to the colder air on the eastern side) very mild indeed - while the areas east of the Cascades feel the full brunt of a true Continental winter. San Diego has the absolute best weather in the nation. When the wind turns easterly along the West Coast it can produce some of the hottest days of the year. Even in January maximums near 90F easily occur during strong "Santa Ana" winds in SoCal.